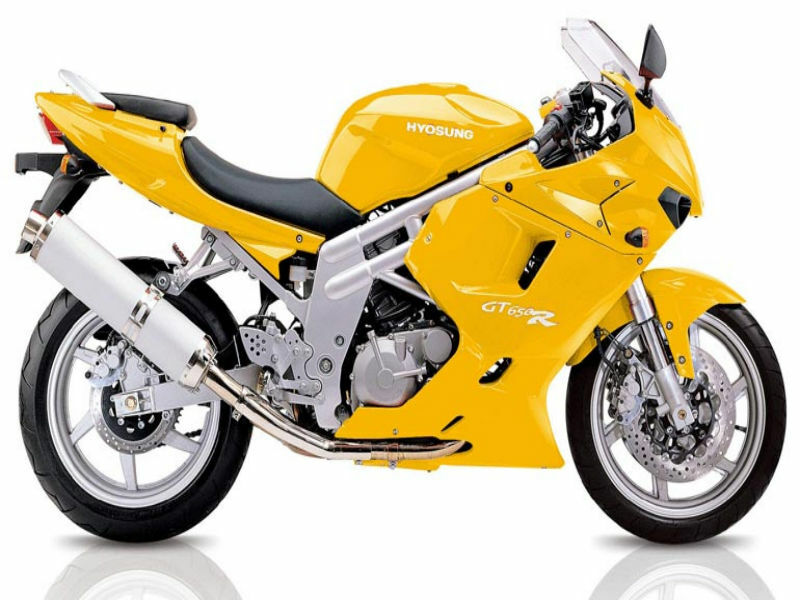 The high performance bike from the South Korean manufacturer driven by a powerful engine has put limelight over its brand Hyosung in India within a short duration. This stylish sports ride is designed beautifully and has some speedy features over it and behind the large fairing that is starting to make an impression in Indian market. The customers are also given a wide range of options when it comes to color of this bike. The roaring sound note produced from this bike can certainly make a difference of opinion that comes out from an Indian street rider' mind. Hyosung GT 650R carries a 647 cc V engine where the cylinders are inclined at 90 degrees to each other. Each cylinder has two valves for the inlet and exhaust and they are active by Dual Overhead Camshaft mechanism. The liquid cooled engine uses electronic fuel injection system which improves the fuel efficiency and the performance at high throttle conditions. The engine is capable of delivering 60.9 Nm torque as a maximum at 7500 rpm. This high rpm range indicates responsive acceleration of the bike till mid and high range speeds. The engine gives a maximum output power of 72.68 bhp at 9000 rpm and with such high power the bike is capable of striking a top speed of 219 km/hr. 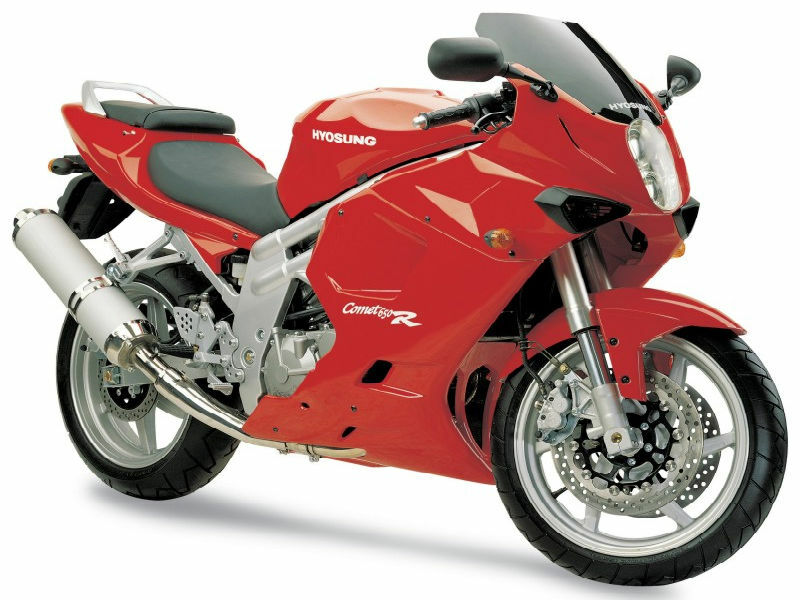 The sport bike has full fairing front with the rear view mirrors mounted on the cowl. The seating position and the handle bar make the rider lean towards the front to reach the handle giving the ride an aggressive look. The rear seat is split from the rider's seat and is at slightly higher position. The front wheel is loaded with a telescopic shock absorber and the rear side with hydraulic mono suspension. The tank design is slightly humpy and is curved to fit the rider's knee over it. The foot rest falls right under the rider adding to the sporty riding posture. The exhaust is coated black on the larger circular cross section and it is held at a higher position towards the rear by a clamp. The bike has large tires that provide better road grip and the velocity over wheels is broken by two discs on the front and one at rear. The double disc on front ensures better braking efficiency by effective heat dissipation by usage of two discs. The long wheel base gives better control over the ride at high speeds on straight line ride. The 6 gear transmission system amplifies the power generated from the engine in an efficient manner to provide performance boost at speeds 0-100 km/hr. The visor over the front fairing cuts the air blowing over the front of the bike and this improves aerodynamics of the ride at top gears. 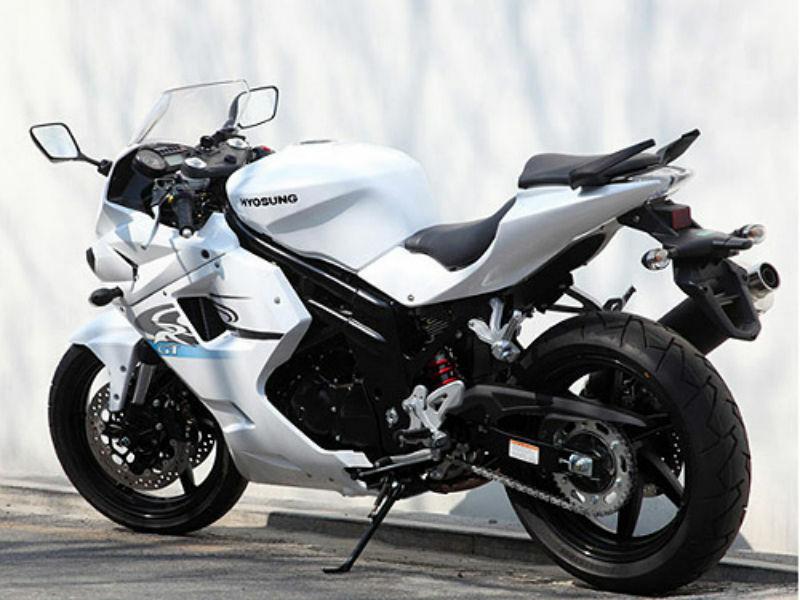 The 650 cc bike can run to about 20kms to 24 kms per litre of fuel depending on the road conditions. The bike would cost about Rs 5,50,000 as per ex-showroom price tag. The bike is available in six color combinations. The ruby red, satin black, white glory, cherry and black, royal sunrise and pure pelican are the six color combination options for this bike.